Try other flavors of low fat yogurt or even cottage cheese. Some foods can cause choking in young children. Be sure that fruit pieces are very small and soft for toddlers. Avoid grapes, chunks of pineapple or melon. Instead, use softer canned fruit, such as fruit cocktail. Peel and split banana lengthwise. Place half in two separate cereal bowls. 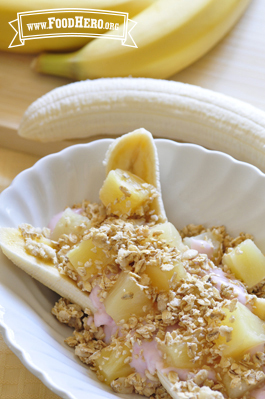 Sprinkle granola over banana, reserving some for topping. Spoon yogurt on top and drizzle with honey. Decorate with reserved granola and pineapple.